Improve quality by understanding the relationships between artifacts across all disciplines. Find and close traceability gaps to ensure full coverage across requirements, design, development and test. Lifecycle traceability delivers a level of transparency that enables everyone to make informed decisions based on business priorities. Teams who face the challenge of improving quality often wonder where to start. Truth is, high quality software is the result of the work of many team members who are dependent upon each others work. Without understanding these relationships, gaps can go unnoticed, teams may focus on the less important areas, and decisions are made with little insight on the impact, all of which can lead to poor quality. The CLM solution uses links to establish artifact relationships. In doing so, users create a web of software development artifacts that is as easy to navigate as the world wide web. Throughout the solution, the same pattern for linking is used, providing a consistent user experience. Whether you are using the Quality Management, Change and Configuration Management, Requirements Management, or Design Management, the choices are the same: users can link to existing artifacts, or create and link to an artifact. 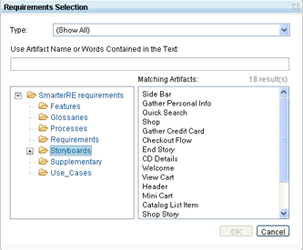 Link to existing artifacts within or across applications. When linking to an artifact, a user simply chooses to create a link. The link picking dialog allows the user to search for the artifact without having to change context. An artifact is selected, the ok button is clicked, and the two artifacts are linked. Create and link artifacts in another repository. If an artifact doesn’t exist in the remote repository, create it! When creating an artifact, one product calls the others creation dialog. The dialog is primed with the artifact types the user is allowed to create. When possible information is automatically populated from the host application. There is a new Traceability view for plans. Once the plan items are created and linked the traceability view visualizes the relationships for each plan item. 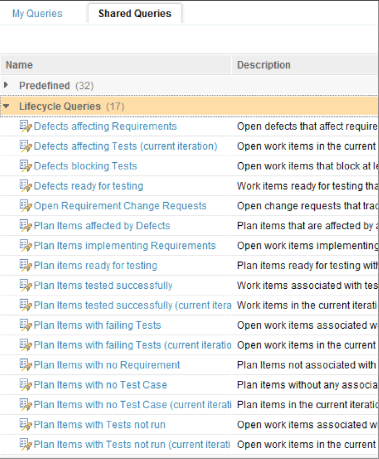 For each item on your plan it shows which requirement it implements, by which test cases it is covered, and what defects affect it. In addition the traceability view highlights test cases which have a failing execution result with a red adornment in its icon in the upper right corner. The image below shows a Plan traceability view, adding a new link to close a gap. Links can also be removed directly in the plan. With configurable columns, link creation right in context, and color tagging to expose gaps, traceability views become the perfect information radiator for your projects. 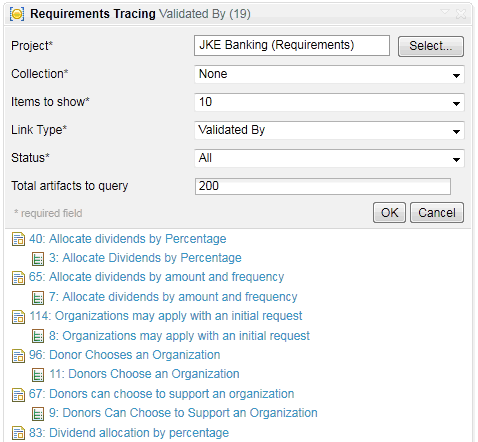 The requirements management application has made significant improvements to create, query and visualize traceability links. You can now display traceability links both as columns in a query result table, and also hierarchically as a tree. The requirements tracing viewlet has been improved to allow customizing content and appearance of the CLM traceability links. Traceability queries can also used to answer meaningful traceability questions. Traceability queries and filters focus on finding gaps and assessing quality. For example, queries are provided to identify plan items (or requirements) with tests not run, or plan items (or requirements) with failing test cased, and plan items (or requirements) affected by defects. These additional queries can be used to make informed decisions on where to focus your efforts. The CLM solution leverages existing links to automate the creation of additional links. This appears on defect submission. When a defect is submitted, traceability links to the affected plan item and requirement are automatically added to the defect. 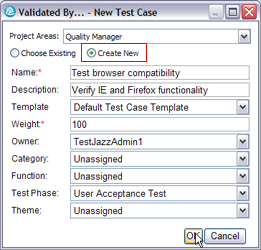 For this to work, the traceability links must first be established on test cases (test case linked to plan item, test case linked to requirement). When this is combined with a traceability view, teams can quickly scan the view to identify what ‘features’ are impacted by defects, and which have the most defects. This is particularly powerful for deciding which defects to fix based on their impact. 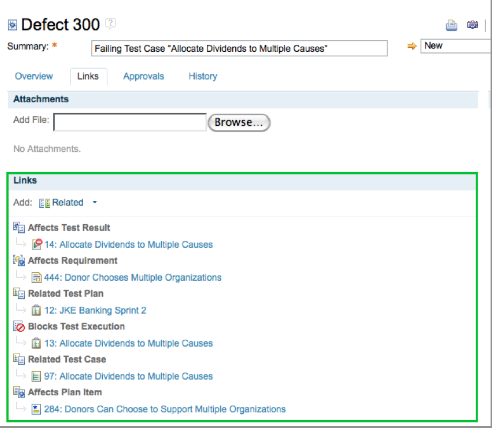 By seeing which plan items and requirements are affected, teams can make informed decisions about which defects to fix. 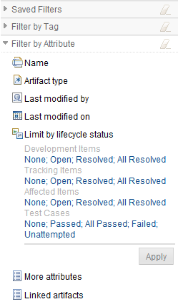 The image below is a traceability view that added the “Affected by Defect” column. Notice how the problem areas are immediately visible, which helps the team make an informed decision on where to focus.